It’s not that we’re a bunch of bug-phobic squeamish eaters here at Consumerist HQ, but we’ll be the first to admit that writing and thinking about cicada recipes caused a few tummies to roil. That’s why we’re super grateful that other enterprising and brave journalists took the hit for us, and cooked up a couple of cicadas on camera to see what all the buzz is about. It’s a meal you can only make every 17 years, and the main ingredient is free if you have the time to step outside and gather a bunch of the buzzers. 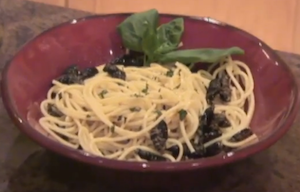 While some recipes call for using the freshly-laid, tender cicada larvae, Brian Donohue at the New Jersey Star-Ledger apparently has a stomach of steel. He and his colleague Vicki Hyman did the dirty work of gathering, blanching, de-winging and de-legging the little buggers, before cooking them up in a kind of cicada scampi. The results? Good texture, crunch, and overall not bad. And again, cicadas are free, whereas shrimp are not. Check out the video below, in the name of science if not culinary curiosity.